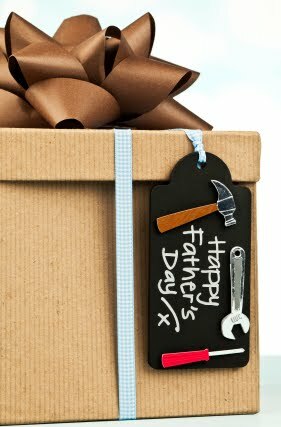 Prepare for Father’s Day this Sunday, June 17th, 2012 by getting a thoughtful and personalized gift ahead of time. Avoid the last minute stress of searching for the right gift for your dad by shopping now – buying a Father’s Day gift with plenty of time allows you the freedom to be truly creative and thoughtful in your gift giving. At Chelsea Gifts Online, we specialize in supplying high end gifts and hope to provide insight for you into how to make some of our favorite men’s gifts personal to your dad. For a sentimental gift with a personalized element, browse the crocodile leather picture frames from L’Objet. Your dad will love placing this designer frame in his office or room – not only does it exude luxury, but it will remind him of his loving children. We love the idea of including a black-and-white photo of the two of you from childhood; the black-and-white augments the nostalgia and looks classy and timeless. For a less traditional gift for perhaps a more edgy dad, look to the King Baby Studio rings, like this Lion’s Head Ring. The King Baby Studio Lion’s Head Ring is one of the more popular rings from this designer – the handcrafted sterling silver ring embodies both high quality materials and rebellious images of a lion. It’ s chunky, masculine and trendy, a great gift for dads. MacKenzie-Childs latest collection of business gifts will have his office or den dressed for success. Look to this masculine & stylish Courtly Checked magazine bin to keep his favorite reads organized. This sturdy magazine bin from MacKenzie-Childs is perfect for the number 1 man in your life – place it in the mud room, office or living room and he can toss magazines, books and other items into one, organized place. You can trust the quality and craftsmanship that are central to the MacKenzie-Childs name but don’t fret about the girly, romantic themes typical to the MacKenzie-Childs furniture or serveware. Include a subscription to a manly magazine to further personalize this gift for your father. If your dad is an entertainer, enjoys cooking or simply enjoys fine cuisine, think about getting him a food-oriented gift. This carving board made from oxidized Acacia Wood is a gorgeous, and manly, option for any dinner party or special occasion. With this Michael Aram carving board, your dad can carve and serve the meat on the same place. Add a Michael Aram meat fork as a finishing touch. Perfect for the grill master in your life. A memo note holder from the GG office collection is the perfect gift for a career-minded man. Whether he works from a home office or the corner office, this gorgeous and high-end memo holder will daily serve as a reminder of his loving gift-giver. To better personalize this gift, you can include customized sticky notes or memo pads with his name or initials – or a cute memo! Go the extra mile and combine this GG Collection memo holder with some of the other designer desk accessories – like a stacked document tray, letter holder or desk blotter. Use your creativity and intuition to take each of these ideal Father’s day gifts and make them special for your own Dad. For any future gift giving needs, remember Chelsea Gifts Online as your online retailer for designer bridal gifts and luxury home gifts. About the Author: Edward Cain is the co-owner of Chelsea at the Grove, a luxury boutique specializing in luxury designer gifts and home décor located in Shrewsbury, New Jersey in the heart of picturesque Monmouth County. Chelsea at the Grove is proud to feature the highly sought after Juliska Berry & Thread, adorable MacKenzie-Childs furniture and the Ralph Lauren Home Collection.